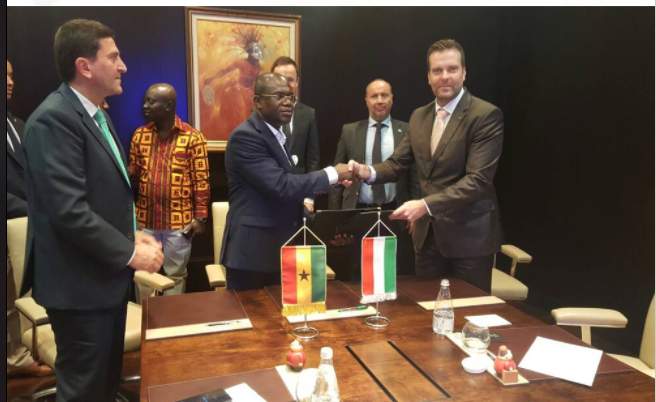 The JOSPONG Group of Companies of Ghana has signed a Memorandum of Understanding (MoU) with Pureco Limited, a Hungarian water resource technology engineering firm, for the design and construction of a state-of-the-art, fully customised wastewater treatment plant (WWTP) in Kumasi to solve the environmental and sanitation problem of the city and its environs. When completed, the facility, which will be the first of its kind in the region, will treat all the liquid waste generated by the about 3 million citizens in Kumasi and its surrounding areas. Currently, liquid waste generated within the region are discharged into open water bodies due to the lack of a facility to treat it. An agreement to commencement and execution of the project was signed last Friday by the Executive Chairman of the Jospong Group of Companies, Mr Joseph Siaw Agyapong and the Chief Executive Officer of Pureco, Mr Balint Horvath. The Minister of Works and Housing, Mr Samuel Atta Akyea witnessed the signing of the MoU between the two organisation. The facility will be managed by the Sewerage Systems Ghana Limited (SSGL), an engineering, construction and procurement specialist subsidiary of the Jospong Group of Companies that focuses on the provision of efficient liquid waste treatment technologies. The Managing Director SSGL, Mr Haidar Said, said the project would be funded by the Hungarian Exim Bank, with the support of the Hungarian government, and financial contribution from the Jospong Group. “The MoU we have signed today is for the first phase of the project, which include designing and construction of sewage septic waste facility in Kumasi,” he said. Mr Said noted that the facility was part of the measures being put in place by the company to properly manage waste in all the 10 regions of Ghana. He said immediately the Kumasi facility was completed, there would be a process to commence other facilities at Tamale and Takoradi in the Northern and Western Regions respectively. Mr Said explained that the facility in Kumasi would have about 40 per cent capacity compared to the Lavendar Hill Treatment Plant which is owned by the same company. On his part, the Chief Executive Officer of Pureco Limited, Mr Balint Horvath, said his company was specialized in design and construction of Sewerage and waste water treatment plants, as well as solid waste recycling plants. Apart from that, he said the company which has a lot of international exposure was also into the construction of drinking water treatment facility in various capacity. Touching on the facility in Kumasi, Mr Horvath said it would be constructed in a way that would help treat liquid waste generated, adding that the company intends to use the best of materials to come out with a modern waste facility. “Right now, we are ready to begin the necessary process to begin work and we intend to complete it on schedule,” he added. In his remarks, the Minister of Works and Housing, Mr Samuel Atta Kyea, lauded the initiative and expressed hope that the project would help address liquid waste situation in Kumasi. WORK on the construction of a seven million euros sewage and waste water treatment plants at Kumasi in the Ashanti Region is expected to begin this month and completed in the middle of 2019.